New Hampshire's furbearer populations are healthy, diverse and abundant. Trappers, who are some of the best naturalists in the state, represent important partners in New Hampshire’s furbearer management efforts. Trapping is a highly regulated activity in New Hampshire. Trapper education is required, as is mandatory reporting of field activities. And, of course, written landowner permission is necessary, among many other requirements. There are fewer than 500 trappers in New Hampshire and the information they provide to wildlife population managers is essential for effective management recommendations. The services that trappers offer the public in resolving human/wildlife conflicts, such as removal of beavers flooding septic fields or raccoons raiding chicken coops, is also essential to maintaining balance between human and wildlife interests. New Hampshire monitors furbearer abundance by way of trapper success, as reflected by the number of animals trapped per one hundred trap-nights of effort. Fish and Game's species monitoring activity focuses primarily on beaver, fisher, otter, mink, muskrat, raccoon, red and gray fox and coyote. For additional information on New Hampshire’s 2015/2016 furbearer harvest, see the 2015 New Hampshire Wildlife Harvest Summary. How are our furbearers doing? The mild weather of the 2015/2016 winter provided favorable survival rates for all furbearing species. Trapping participation was down during the 2015/2016 season; a result of low fur values. The 2016/2017 season should be an exciting adventure with furbearer numbers above the previous season for many species. During the early spring months of 2016 several gray fox were documented as succumbing to canine distemper. 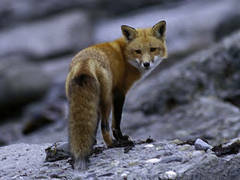 The statewide effects of the distemper event on foxes are unknown at this time, and while there are no known human health implications, it serves as a reminder to ensure your dog’s vaccinations are current. For specific information regarding New Hampshire furbearer hunting and trapping seasons, see the NH Hunting Digest.